After showing signs of life in 2014, autonomous cars became all the rage during the 2014-15 automotive trade show season, giving us a glimpse into our near future. With everything in our busy lives demanding attention, it’s difficult to stay informed on the movement to wrestle the steering wheel out of our hands. Sound interesting? Far fetched? Something for our kids to start imagining? Well, it is definitely happening. The only question is when, not if, our cars will drive us to our destinations. Announcements at the 2014 Connected Car Expo at the Los Angeles Auto Show, the 2015 Consumer Electronics Show and the 2015 Detroit Auto Show created considerable buzz regarding autonomous, or self-driving cars. The common denominator was to encourage cooperation between designers, engineers and suppliers to get self-driving cars on the road sooner than later. After much excitement, it looks like the soonest we will see fully autonomous cars on public roads will be between 2025 and 2030. Considering this is an automotive industry hot topic and that significant advancements and investments were made in 2014, why the delay? Is there more smoke than fire? To gain a basic understanding of the engineering, design, technological, logistical, and regulatory factors involved with autonomous cars, let’s review two challenges facing a world where computers and sensors do all the work. The technologies that need to be perfected are Vehicle-to-Vehicle (V2V) and Vehicle-to-Infrastructure (V2I) communication. Developers have a good start on cars being able to drive themselves using radar, lasers, cameras, and other sensors mated to computers with proprietary software (on closed-course testing). The next big steps will come when self-driving cars are able to detect and/or communicate with other vehicles, pedestrians, bicyclists, buildings, crosswalks, trees, potholes, and any other obstacles, uncertainties, and emergencies. They’ll also have to deal with inclement weather that impacts cameras and other sensing devices, and hacking, both of which could bring chaos to the normal driving adventure. Then there is the single biggest roadblock: who is responsible when an autonomous vehicle is in an accident? Clarifying the liability issue is so crucial for autonomous vehicles, but federal and state governments do not have a handle on it. Nor will they anytime soon. The hotbed for autonomous car development is California, but their DMV missed a state Senate deadline of January 1, 2015 to establish self-driving car regulations due to safety and liability concerns. The liability issue is no small obstacle. The first time your autonomous car bangs into something or someone, the question will be asked: who was responsible? The driver? There was no driver. The company that built the car? What about the manufacturers of the computers, cameras or sensors? Maybe the city where the accident took place was negligent because their infrastructure was not prepared for self-driving cars. Or, maybe, because cities allowed these technological marvels to operate on city streets at all. How do insurance companies even begin to write policies until all this is sorted out? Now to the good news. Let’s look at where we are now regarding the technology and accomplishments that will take us into the next phase of development. Audi has taken the most realistic and real-world approach by not proposing that your car be completely self-driven. Confusing? According to Brad Stertz, Manager with Audi Communications, Audi’s approach is to combine the “foundational technologies” of advanced driver assistance systems with “piloted driving” technology. They plan to offer cars that safely relieve some of the driving duties, in different circumstances, up to 70 mph. 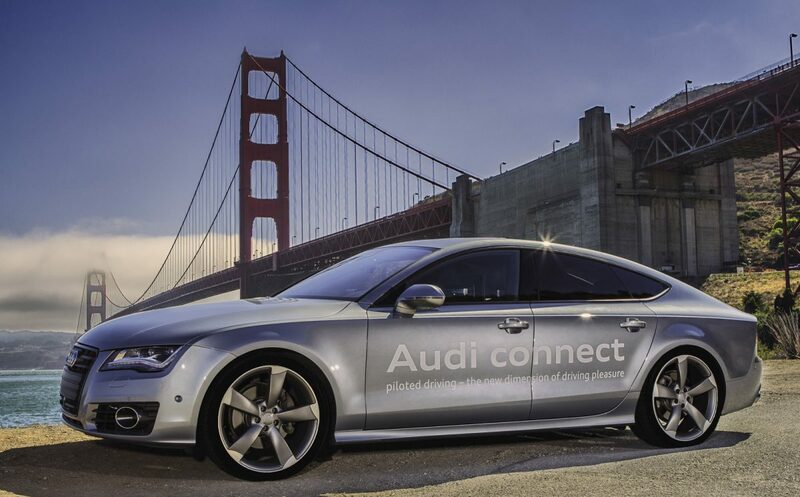 To test their approach, Audi successfully “drove” an autonomous A7 from Palo Alto, CA to Las Vegas for the 2015 Consumer Electronics Show. This 560-mile long test drive implemented Audi’s piloted driving concept of offering the driver a digital pilot to guide the trip and assist in reaching the destination safely. Audi does not want to take away the joy of driving, but rather create a human-machine interface that clearly identifies which entity is in control – human or machine. Another Audi technology is Traffic Jam Pilot, what the company calls their “congestion pilot.” During a traffic jam, it relieves the driver of the task of driving while the system automatically accelerates, brakes and steers the vehicle at speeds up to 37 mph. Once the traffic jam disperses or the end of the highway has been reached, the driver is prompted to take control. Another technology, Highway Pilot, takes automated control between 55 and 70 mph. It has been tested at Germany’s Hockenheim race track, where an Audi RS 7 piloted driving concept car completed a lap at race speeds of well over 140 mph. Audi hopes to have some of these digital pilot technologies available to the public by 2018. If you live in Silicon Valley, you have seen one of Google’s 20 or so cars equipped with their autonomous vehicle test equipment. Their fleet of Toyota Prius and Lexus hybrid SUVs have put on more than 700,000 semi self-driving miles in the most difficult conditions possible – crowded Santa Clara County streets. Even after this amount of time and travel, Google admits that many issues remain to be solved until autonomous vehicles are ready for prime time. However, Google has taken their development activities one step further, and in a big way. Through a consortium of suppliers and auto manufacturers, Google has assembled a team of companies to help design, and eventually build and market their own self-driving car. This gondola-on-wheels shaped, all-electric, two-seated concept vehicle is missing three major components: a brake pedal, accelerator pedal, and a steering wheel. You will not find any rearview mirrors, either, because there will be no driver. The car’s round shape and huge windows makes it seem like you are sitting outside while being driven around town. Google hopes to launch on-road testing in 2015. Due to California regulations, the street versions will have a brake pedal, accelerator pedal, and a steering wheel, along with a test driver. There is no forecast for when the Google self-driving car would be available for sale. Google has even said publically it does not want to enter the car business. The F 015 self-driving luxury sedan concept car made its world premier at International CES 2015. This fully operational car is unique with a “private retreating space” interior that features a lounge-like ambience. Dieter Zetsche, Head of Mercedes-Benz Cars, says the F 015 is “going beyond its role as a mere means of transport and will ultimately become a mobile living space.” M-B hopes to have the F 015 on the road by 2030. In January 2015, Nissan entered into a five-year R&D partnership with NASA to develop and test autonomous vehicle technology. Nissan is looking for answers for driving on Earth, and NASA wants to improve the ability of their robotic rovers for planetary missions. Nissan has converted a zero-emission, all-electric Leaf at NASA’s Ames Research Center in Mountain View, CA, to test human-machine interface solutions, network-enabled applications, and software analysis and verification. Which autonomous car project will we see first in a semi-public way? Most likely the Audi approach, which combines the advanced driver assistance technology with autonomous features. It will be rolled out slowly, before we get anywhere close to fully autonomous cars. That will be the time when you simply punch in our destination, sit back, pour a drink, cue up a movie, maybe take a nap, and then voila…you have arrived! JOHN FAULKNER is a Senior Writer at Innovation & Tech Today. He previously wrote on the greening of the wine industry in our Winter 2015 issue. He is based in Southern California.